Samantha Bee has apologized for mocking a cancer patient’s haircut during a recent segment on her show Full Frontal. The host had joked that an attendee at this year’s Conservative Political Action Conference looked like a Nazi because of his hairstyle, only to discover he actually had cancer. “This year, the bow ties were gone, replaced by Nazi hair, Nazi hair, Nazi hair,” the video narrated while zooming in on 20-year-old student Kyle Coddington. But when his sister tweeted the comedian she soon realized her error. The show also tweeted a similar message. 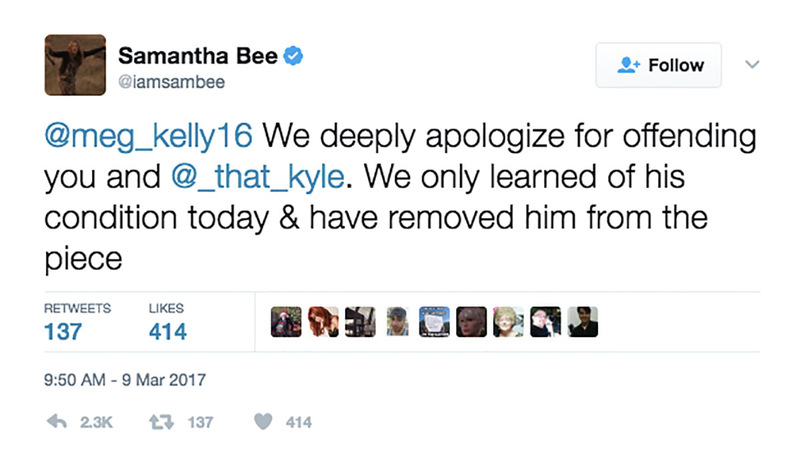 Coddington himself had begged her to “please delete the episode,” because “I look like a balding potato,” but he didn’t fully accept Bee’s apology. However he did thank Full Frontal for donating to his GoFundMe page. Read his full statement above.